Whitehawk 2 Eastbourne Borough 0, 26/12/2014. The Enclosed Ground, Vanarama Conference South. 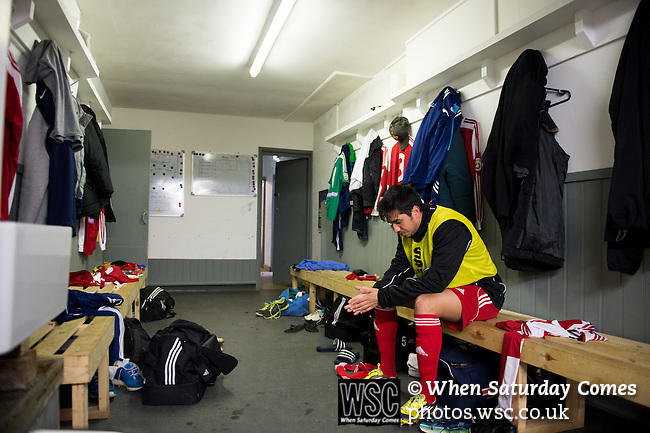 Gerardo Bruna in the changing rooms prior to kick off. Bruna spent five years in the youth set-up at Real Madrid from 2002 to 2007. In the summer of 2007 Bruna moved to England to sign for Liverpool, having been offered and turned down a professional contract by Real Madrid. Photo by Simon Gill.